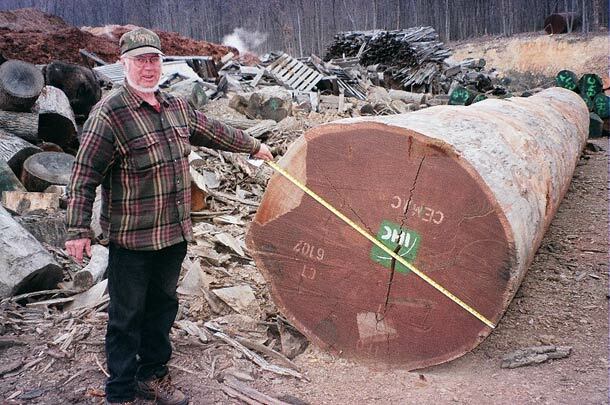 A while back, a great friend, our neighbor and caretaker Bob Willison, who kept an eye on our country log cabin when we were back in Pittsburgh, called me to describe one of the biggest logs he had seen in a long time. Bob’s primary work then was logging in the mountainous parts of Bedford County, PA and he took regular truckloads down to a sawmill near Cumberland, MD. He usually drove at night and used a lightly traveled back road since his truck lacked some of the niceties that strict adherence to the law required. Shades of the 1920′s and trucks full of moonshine evading the revenuers. The log he had spotted at the mill had been shipped from Africa at a substantial cost by someone the mill owner knew and pieces of it were available for purchase by crazies like me. The short of it is: I now have in my storage barn three slabs of African sapele wood, each 12 feet long, 3″ thick, and 52″, 49″ and 48” wide respectively. This is a wood that high end car makers sometimes use for fancy dashboards. I hope to find someone looking for a spectacular conference table (or dining table) to seat 14 very comfortably. If that sounds tantalizing, call us. The 3 slabs of sapele have an appealing soft rose color that can be darker or lighter as desired.